With over 25 years of experience as a coach, trainer, clinician and judge, you are in good hands. We focus on developing a working relationship between you and your horse that is based on respect and understanding. 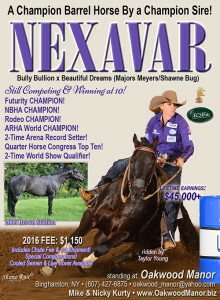 Lessons are available for English, western, and barrel racing. Bring your own horse or ride one of ours. We have several wonderful, safe, quiet, patient lesson horses for beginners or timid riders and a handful of other horses available that can help more accomplished riders to fine tune their aides, seat, and skills and develop more sophistication in their riding. All you need to get started is a pair of boots with a heel. We have helmets you may borrow to get you started. 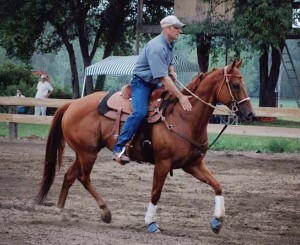 Training is available for both barrel and pleasure horses, and our packages include full board with excellent care. 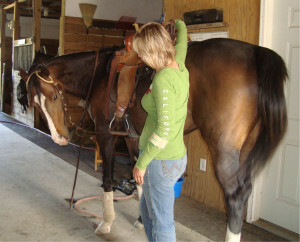 Horses are ridden five to seven days a week. Often daily rides begin or end with a short trail ride where the horses relax and work on putting the skills they have learned to good use. We believe in short training sessions, sometimes several a day, rather than long marathon sessions that leave the horse (and me!) exhausted and frustrated. We live by the great Tom Dorrance’s statement to “make the right things easy and the wrong things hard”. It is important for the horse to want to work with the rider as a team. All of our horses start with the same solid foundation regardless of the discipline they will eventually assume. We begin in the round pen, where a relationship with the horse is established. One of the best compliments Nicky says she ever received was that she is “firm but fair”. 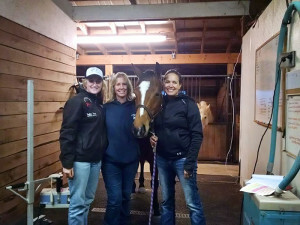 She has very high expectations for her horses and her students, but will do everything in her power to help them to understand, reach, and exceed their goals. After we begin with round pen work we move on to riding, focusing on developing a quiet, responsive, cooperative, flexible horse. Clinics are one of Nicky’s favorite services to provide. Students can expect a great deal of one-on-one time with topics focused on riders’ needs. You are welcome to come to one of our scheduled clinics, usually once a month, or you can get a few of your friends together and design your own clinic at Oakwood or at another venue of your choice. Prices are reasonable, and we always have a great time laughing and learning. Videos can be taken throughout the day, and reviewed during breaks. We also enjoy providing a homemade dinner Saturday nights of two day clinics. Riders are welcome to stay with us or bring a tent or camper. Some ads catch your eye more than others. Buying and selling horses can be very time consuming and stressful. If your horse needs a new home, and you want him to put his best foot forward, let us help you! Are you looking for a new horse? We can help with that, too! If we do not have the perfect match for you already living in our barn, we would love to help you search for your new addition. 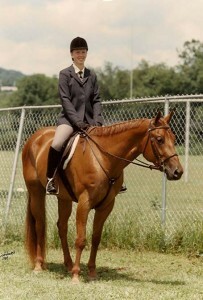 Nicky’s experience includes over 25 years of judging 4H, open, and schooling shows. She enjoys providing brief feedback to competitors after each class so showing becomes a relaxing, fun, learning experience. Qualifications include English, western, jumping and driving. Pennsylvania 4H certified. A graduate from Cornell University Farrier School, Mike has over 20 years experience shoeing pleasure, hunter, dressage, & barrel horses. He is a Certified Journeyman Farrier in the Brotherhood of Working Farriers and an American Farriers Association Member. Corrective, hot and cold shoeing available. Appointments are limited. Please contact us for more information!